I can't pretend to understand completely the full significance of the technical advisory, and it is unknown how the County will eventually apply these guidelines in their review process, but much of what I can understand seems to support my own naive effort with the Commissioners in 2016 to quantify the energy impacts (GHG's) of the Mountain Peak project. "As I pointed out in my previous letter, the amount of energy to be saved in the building through LEED compliance might be compared to the energy spent on the 44,000 trips up and down the 6 mile road each year, 260,000 miles, 10 trips around the earth each year just to get to the project from the Trail. Remoteness is at the heart of this inappropriately ambitious project and of the very large amount of energy consumed in accessing it. " The real story here is not that another event center will be adding its traffic to the county’s road congestion, even in the remote areas of the county, and that its patrons will be adding to the tourists stealing the towns and rural areas from their residents. The real news is that Comm. Hansen voted to turn down her first event center. What’s going on here? Of course Comm. Gallagher also voting out of form, approved the project on the basis of a modest reduction reduction in capacity. But the fact that one of the most reliable pro-development commissioners has turned down a project, even after the pro forma concessions from the developer, hopefully says that some attitudes may be changing regarding the value of tourism development in the remote areas of the county. After its near denial at the Aug 1, 2018 Planning Commission hearing, the Maxville Lake Winery is up again on Sep 5th. (Agenda and documents are here) Tours and tastings remain the same as proposed in the rejected scheme, but events have been reduced from 6210/yr to 3900/yr. In total 20500 visitors will be adding their traffic to the remote Chiles-Pope Valley Road each year rather than the 23110 previously proposed. Does that make it acceptable this time around? It will be followed by the Aloft Winery, at a remote-dead-end-road location. With a more modest 5260 visitors/yr, and a provenance of renown, it will be an easier approval. But as the Maxwell Winery shows, the initial building of a winery is just phase one in bringing additional tourism urbanization and traffic to the remote corners of the county. On Aug 1st, 2018 the County Planning Commission decided not to approve a use permit major modification request for the Maxville Lake Winery on the remote Chiles Valley Road. In a subsequent motion the project was continued until Sep. 5th. The request would add 175,000 gal of winery capacity per year bringing the total to 240,000gal/yr and 11,590 additional visitation slots per year bringing the total to 23,110 visitors/yr. The project was somewhat unique in that a very large winery building was approved in 1998 to handle a medium sized production capacity and visitation. The current owners now want a capacity and visitation commensurate with the size of the building. The project was initially denied on the basis of its remoteness for the production and visitation requested. After presentation and discussion, Comm. Scott made the motion to approve. The vote was 3-2 against approving the project. Comm. Whitmer joined Comm Scott in voting to approve, which was a bit of a surprise because of his previous concern over the constraints of remote locations. Comm. Cottrell, consistent with votes since Mountain Peak, could not approve the project because of the amount of visitation and production in such a remote location. Likewise Comm. Gallagher who has also been consistent in looking hard at wineries as tourism venues. "Where I am struggling is the number and intensity of marketing events on this site in a remote location... In this particular case all the winery comparisons are on the valley floor... they're not 6 miles up in the hills from St. Helena in a remote location...We've had a lot of conversation about intensity of use and appropriateness of location and treating every location independently and customizing it to that space... What we've been hearing is that there is need for tasting and events because there isn't distribution... face-to-face consumer interactions that are very necessary to a business that doesn't have that distribution channel. Here I feel like they're getting both ... and that's a lot to send 6 miles up to the east..."
"6 miles up in the hills... in a remote location" just struck a chord, I'm afraid. 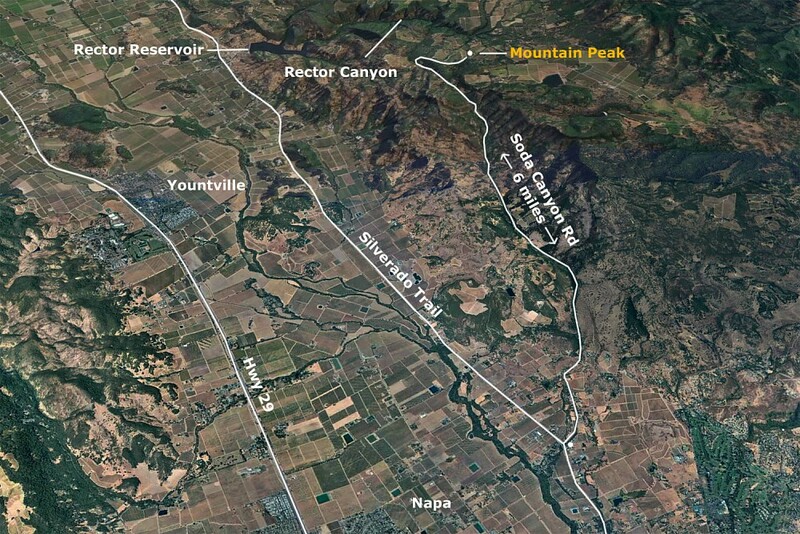 The proposed Mountain Peak winery next door to us, which Comm Hansen approved in 2017, is 6 miles up a dead end road, one that is more convoluted and in much worse condition than Chiles Pope Valley Road. In Maxville Lake, Comm. Hansen made a clear distinction in her thinking between tours and tastings at 46 visitors/ every day (which she was OK with) and events either 30 visitors/day twice a week or 95 visitors twice a month (which she didn't like). I didn't quite get the distinction. 25-75 people arriving every day seemed to me as impactful, if not more so, than the less frequent events. The visitation numbers of both wineries are similar at 275 vs 325 per week. Mountain Peak's event numbers, which initially were similar but were reduced during the hearings, may be the reason Comm. Hansen felt she was not being inconsistent in opposing this remote winery while supporting Mountain Peak. It was hard for me to see the decision in that light, I'm afraid. Regarding distribution and the need for winery consumer sales: it is worth mentioning that it is possible to find less impactful ways of marketing than inducing tourism to the remote corners of the country. Mountain Peak's owner, realizing that building a winery would not be a quick process, opened a tasting room across the street from the Archer Hotel (opened 2 days after Comm Hansen approved the project) and has contracted with distributers to sell their wine in California Nevada and Arizona. For those vintners that are in the business of wine making rather than wine entertainment, at-winery marketing is not the end all even for new wineries. Maxville Lake was not the only winery taken up by the Planning Commission on Aug 1st. The Castlevale Winery, with crenelations and turrets, was unveiled up the road from Maxville. Given its modest visitation and productions numbers, and its royal provenance (a Martini scion), it was approved without issue. It will, of course add a bit more tourist traffic to the remote byways of the county. Considered along with the continuance of Maxville at the Planning Commission next month will be the Aloft Winery, another "6-miles-up-a-remote-dead-end-road" winery, with a modest visitation proposed by another scion (Mondavi). The modest visitation now seems to be a selling point in getting new wineries approved. As we have seen in the many major mods coming up before the commission, and as presented in Maxville, a future visitation upgrade after the project is in place is perhaps becoming a more palatable route to tourism intensification. And tourism intensification now seems to be the goal of most winery development in the county. The question these remote wineries pose is whether it is justified, in an age in which GHG generation and vehicle-miles-traveled (VMT) are becoming the metrics of ethical development, to promote a tourism model that involves transporting ever greater quantities of tourists and tourism employees to the remote corners of the county. In a recent study, tourism now accounts for 10% of global carbon emissions. The extra tons per year generated by tens of thousands of 6 mile trips to wineries in Napa county will probably not move that percentage very much, but the fight against global warming is being fought at the micro level throughout the world and Napa should be doing its bit. Electric charging stations and bicycle racks in these remote locations may win an approval or a LEED certification, but are really just palliatives considering the GHG's created by vehicles traveling that extra 6 miles. The 2010 WDO update (which allowed increased food service at wineries) has an appendix that counters the obvious inducement to tourism that the allowance provides with a warning to consider remoteness in winery approvals. The Napa County General Plan extolls urban-centered growth. The LEED certification process gives significant points for the same goal. The evaluation of GHG's generated by projects CEQA analysis is becoming an ever more important part of the process. The county is about to take up its won Climate Action Plan. It is time for the County to give more serious consideration to winery development on the basis of remoteness to discourage transportation dependent tourism.